WINNER OF THE RICHARD AND JUDY AUTUMN BOOK CLUB*'One of the most charming novels either of us has read. Don't lose it. Keep it' Richard & Judy**The perfect holiday read, recommended by thousands of readers**One of the Mail on Sunday's 'Best books for the beach this summer'*Meet the 'Keeper of Lost Things'... Once a celebrated author of short stories now in his twilight years, Anthony Peardew has spent half his life collecting lost objects, trying to atone for a promise broken many years before. Realising he is running out of time, he leaves his house and all its lost treasures to his assistant Laura, the one person he can trust to fulfil his legacy and reunite the thousands of objects with their rightful owners. 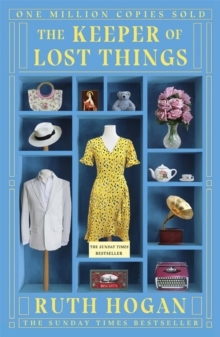 But the final wishes of the 'Keeper of Lost Things' have unforeseen repercussions which trigger a most serendipitous series of encounters... 'Hogan's touching, funny and romantic debut is that rare and precious thing: a real story with brilliant characters.' Daily MailAnd if you loved The Keeper of Lost Things, don't miss Ruth Hogan's new novel Queenie Malone's Paradise Hotel, which is out now.